The secret to a crispy coating is to keep the beer batter cold. I like to mix it and chill in the freezer for 20-30 minutes before I dip a flour coated onion slice into it and fry. I was never really a big fan of onion rings. I know looking at these pictures, one could think that was ridiculous. I mean-look at them. Golden brown and crisp with a sheen of grease that just tempts you like a sea siren’s call. Meh…just not for me. I always felt like I could never just bite into them because when I did, the batter always fell off and the slimy onions inside dangled beneath. Add to the fact that they come apart in your hands, they also had no flavor. Still…it is fried and I love most things that are battered and fried. To give up the onion ring would be to betray my gut instinct. 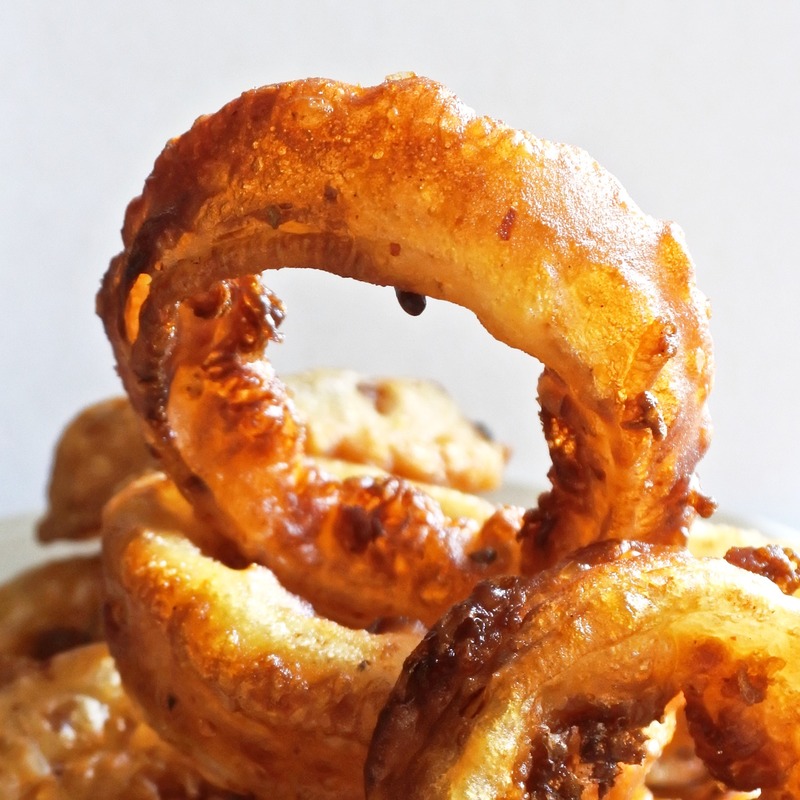 So I persevered with different recipes and became a discerning critic of many an onion ring. It was grueling and difficult work ordering and consuming them in many a restaurant here and there. Yet I continued onwards with my search until one day, it happened. On that fateful day, all of my hard work was rewarded when I found the one onion ring to rule them all. Take a thick slice of onion. Coated in a cold beer batter of flour, cornstarch, lemon juice and spices. Fry it up in hot oil and you will to be blessed with the most beautiful onion ring you’ve come across. The crunch can be heard from the next room over. Similar to the sound a dog makes while savaging a bag of Cheetoes. Finally, I have become an onion ring fan. Feel free to use any remaining beer batter to dip fish, chicken or even mushrooms into it and fry to your heart’s content! In a medium to large mixing bowl, combine flour, cornstarch, spices, salt and pepper together and mix until properly combined. Add lemon juice and beer then whisk until you have a thick batter. Batter should be a thick paste but still fluid. Refrigerate for 30 min- 1 hour. You want the batter to be cold when it hits the oil. While the beer batter is chilling, peel and slice onions into 1 cm (1/2 inch) thick slices. Carefully separate the onion slices into rings. Coat with a light dusting of flour and let rest for 5-10 minutes. When batter is cold, dip floured onion rings into batter, lightly shake off excess batter and deep fry it in HOT oil until crispy and brown. Remove from heat and let excess oil drain off on paper towels. Serve with your favorite dipping sauce and enjoy. Serve hot and with your favorite dipping sauce.